In 1910, at 17 years of age, Alvin Andrews first aided in the founding of Wilson Bros. and Co. grocery store in Ontario, Oregon. In 1914, Al would move with his wife, Leada Winifred Foote Andrews, to Falk Store, Idaho, where he and his wife would own a merchandizing store and act as the region’s postmaster. 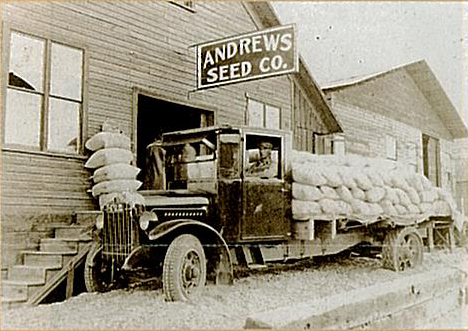 After arriving home from the US Navy in 1919, Al and Leada would move back to Ontario where Al would established Andrews Seed & Grain Co. Andrews Seed Company was built in its current location in 1923. After graduating from Harvard’s Business School and serving as a pilot over the Pacific in World War II, John Stubstad moved to Ontario, Oregon, and purchased Andrews Seed Company from Alvin Andrews in 1955. Under the watchful eye of Mr. Stubstad, Andrews expanded in may areas of business: agricultural wholesale/retail and a garden center and nursery. Upon the passing of Mr. Stubstad in 2003, the business was purchased by David Polhemus and Mike & Susan Kurth. In 2016, David retired, and sole ownership passed to Mike & Susan, who continue to run the business to this day. Mike & Susan have been employed by Andrews for 40 years, along with several staff members who have also been involved for over 40 years. We have many other long-term employees, as well as some newer arrivals, who are all an integral part of our ongoing operation. Our success with maintaining quality employees speaks volumes to our success in the business.